Dazzle your family and friends by using this Dungeness Crab Casserole Recipe for breakfast, brunch, lunch or dinner. Serve with fresh fruit and / or a salad for a complete meal anytime. The earliest strata recipe known is a 1902 recipe for cheese strata - a gratin of layers of bread, white sauce, and cheese, but no eggs. This casserole recipe may be made ahead of using, or even the day before you need it, so it is a great item to serve when entertaining. Serve this seafood casserole recipe with a variety of fresh fruits and sliced avocado or a wild green salad tossed with avocado and a light vinaigrette dressing. Finish your meal with the restaurant recipe for Apple Crisp for dessert! Sit back and enjoy the applause after the meal! 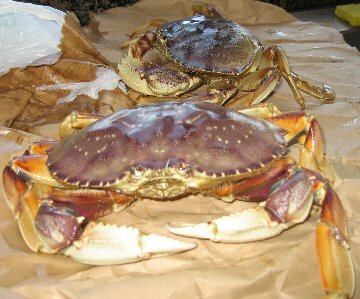 Because of where I live (the great Pacific Northwest - USA), I use Dungeness crab in many of my crab and seafood recipes. Like all crabs, Dungeness crab is high in protein and minerals and low in fat. About one quarter of this crab's weight is meat, making it one of the meatiest crabs available. Most of the meat is in the eight legs and two claws, although the body contains a lot as well. It has a delicate flavor and is sweeter than most other crabs. For most recipes I buy "Picked Meat" which is usually sold as a mixture of whole and broken leg meat, accompanied by the pure white ‘body meat.’ It is fully cooked and ready to use for your favorite recipe. Although buying crab meat like this is expensive, it saves me a great deal of time and effort at home and it saves a great deal of kitchen labor at the restaurant. This recipe will work with whatever crab you have easy access to so don't be afraid to try it just because Dungeness crab is unavailable or too expensive. I also use Tillamook cheddar cheese in many of the recipes, including this crab casserole recipe because it, too, is readily available locally and its quality is really great. I am fortunate to also have local organic cheese makers so I often purchase cheese from them. Preparation time: 20 minutes. Serves 12. 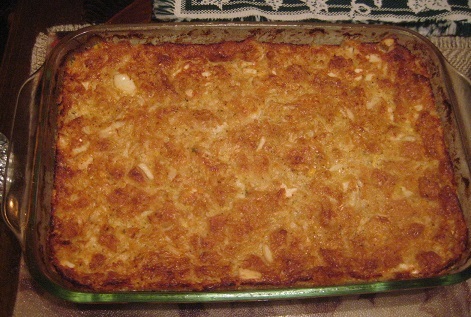 Enjoy your restaurant recipe for Dungeness Crab Casserole and the company of those you share it with! Did you know? 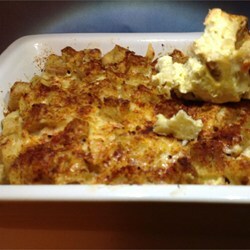 "Strata" or "stratta" is a family of layered casserole dishes in American cuisine. 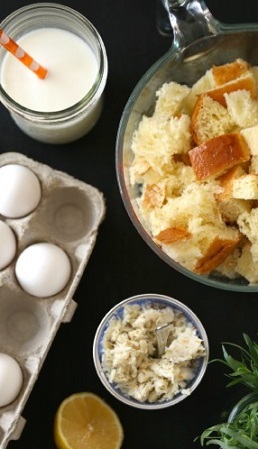 The most common modern variant is made from a mixture which mainly consists of bread, eggs and cheese and may also include meat, seafood, chicken or vegetables. The usual preparation requires the bread to be layered with the filling in order to produce layers (strata). It was popularized in the 1984 “Silver Palate Good Times Cookbook” by Julee Rosso and Sheila Lukins.